How is that for a title? It gives you a little hint at what I'll be blabbing about today. Today I am back after a 19 day absence. It felt like an eternity... and I have a long list of reasons why, but I'll spare you the book and just give you a condensed version. Ready? I started with Clearly Sentimental about Harvest and 2 of the new Die-namics dies being released on September 1st: Perfect Petal Trio and Perfect Bracket Edge. What makes the Perfect Bracket Edge perfect, you ask? (even if you didn't ask, just roll with it) Well... it was uniquely and geniously designed to work with various widths of paper. It has several levels of lumps and bumps, which translate to a beautiful design for the edge of your paper, from 6 inches, down to 3 1/2 inches. To demonstrate it, I made a trio of cards, all with a different length of Perfect Bracket Edge. For this card, I die-cut a strip of paper and adhered it to the bottom of the white card base, which is 4 1/4 inches long. 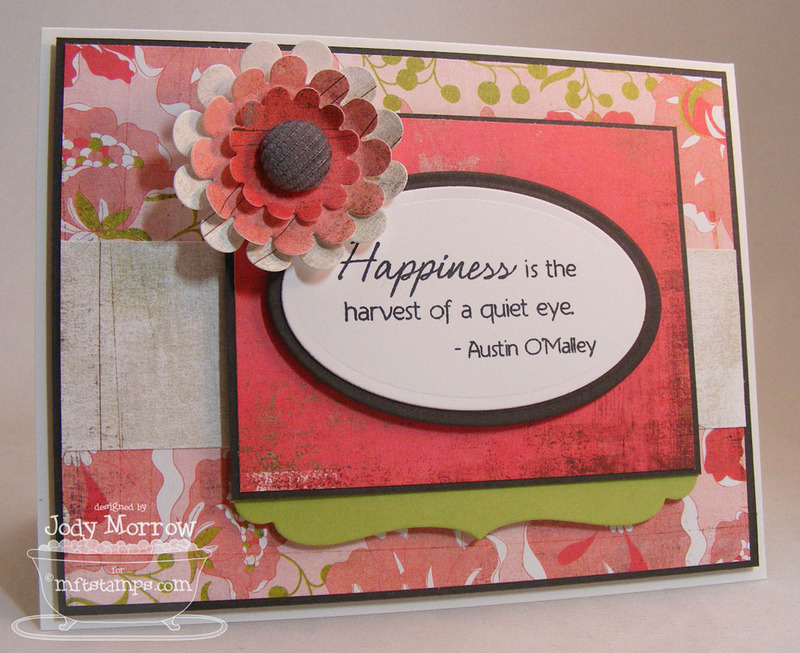 For this one, I die-cut a strip of paper that was 3 1/2 inches long and used it along the bottom of my sentiment panel. 3 different looks, all from one edge die! Pretty nifty, huh? Did you notice all my patterned paper flowers? 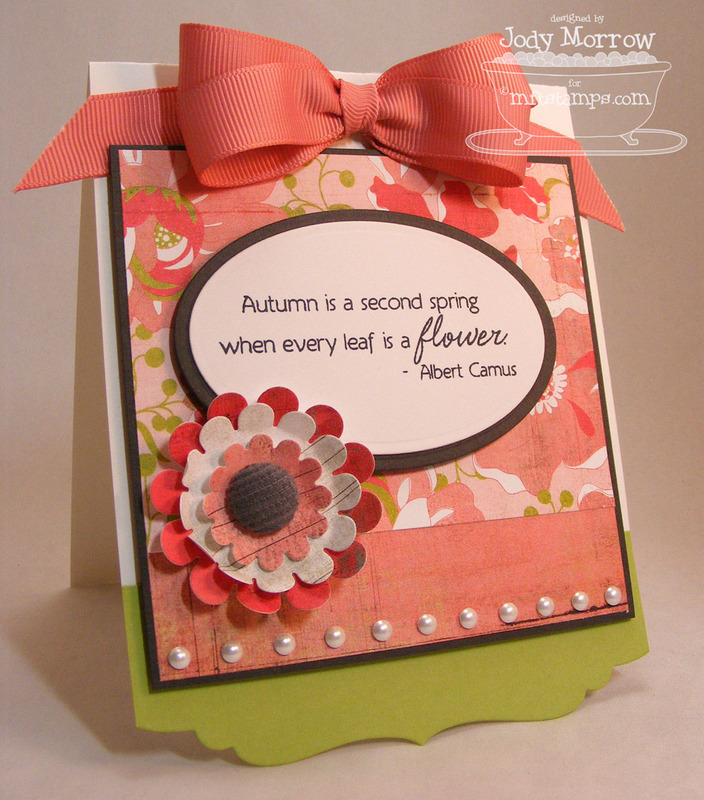 Those were made with the new Perfect Petals Trio Die-namics die. 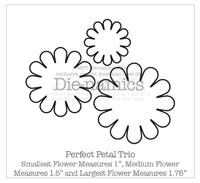 They are a nice scalloped shape, with deeper petals, for easy curling and manipulating the petals. I like that! I used another stamp set that will be released on September 1st, Tiny Town Halloween. 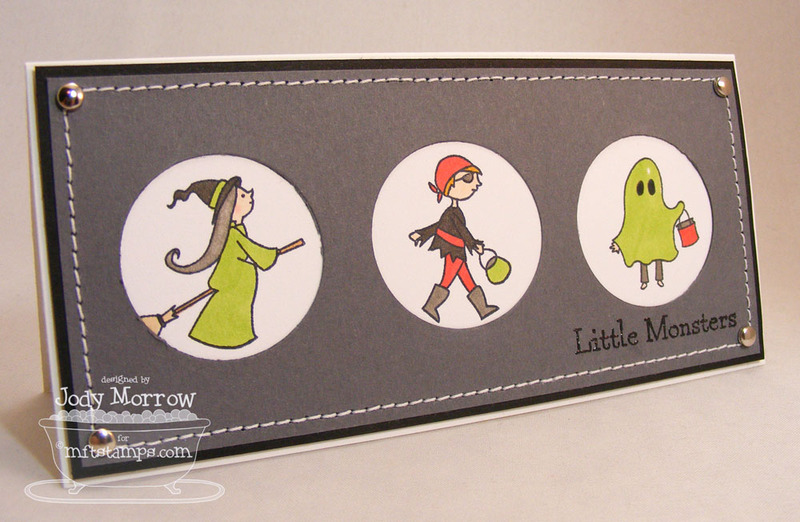 As the name suggests, the images in this set are tiny and perfect for simple cards and small Halloween treats. The MFT release is on September 1st at 10 PM EST. You can attend the release party from 8-10 PM EST here in the forum for fun, games, and prizes! If you'd like to see all the teasers for today, please click on over to Kim's blog at 11 AM EST. Be sure to leave comments as you go for a chance to win one of 2 sets being given away, just for leaving a comment. :) Check Kim's blog every day for the winners. I love that new bracket die! Great cards, as always. Glad you are feeling better! Glad your feeling better! The cards are AWESOME!! Love those dies! Question.....the dp on the first cards? Beautiful colors!! Thanks for sharing! welcome back! life happens, no appologies needed. THESE are fantastic. love how you showed off the bracket edge-it is GREAT! Love these Jody! I also love how you showed the different widths of the bracket die! Genius I tell you! Glad you're feeling better, but you in bed early? Hard to believe! Love your cards!! The bracket die is sooo COOL! Jody....thank you soo much for showing how this bracket die works!! I was fortunate to have the opportunity to already buy this die but wasn't sure exactly how to use it. Kim was at my LSS on Thursday and I picked up most of the new dies there! Can't wait to use this die on the edge of my card like you did!! The flowers are so pretty and I love the porthole card! Darling. Your floral cards are soooo beautiful, Jody...and your Halloween cards, so cute!! 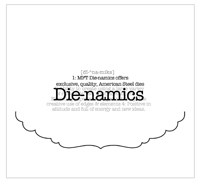 Lovin' the new dies!! these are all awesome cards & the new dies are amazing!! so so glad you're feeling a little better-it's so hard when Mom gets sick. 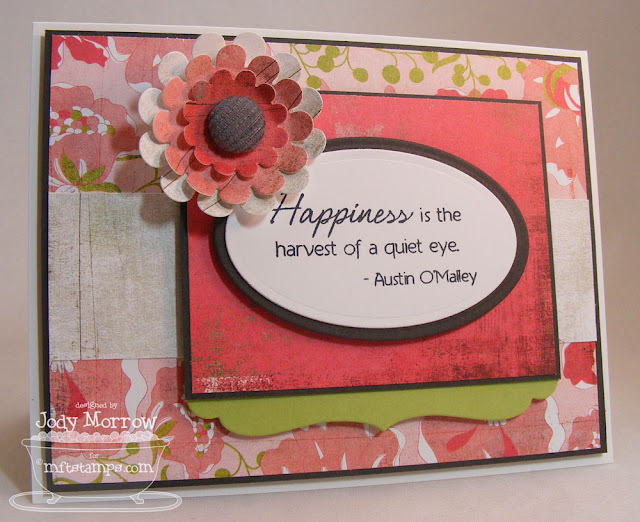 Thanks for showing us so many ways to use the bracket die--great cards! Beautiful cards! Thanks for sharing them with us during the hop. Hey Jody, hope you are feeling better. Love your samples, those new dies are to die for!! Welcome back. I'm SO sorry you've had such a rough go of it lately. Your projects today are all AMAZING. Love them! LOVE your cards, especially the flower ones. Great new flower and bracket die and of course I will need to have those asap LOL. I am still waiting for my other dies which take a long time to ship to the Netherlands (not so LOL). They are probably stuck at customs, sigh. Hope to see some more great stuff soon! These are great dies! Looks like I need to be saving my lunch money. Beautiful cards! Great Cards! Just love them! Trying out the Blog hop! Cute cards, I love the colors on the first two! Well, you may have taken a break, but you came back BIG! Great, so creative cards! Thank you so much for showing us the different sizes of the Bracket Die!! That was so clever, and I love how you used it all three ways!!! Your creations are just lovely! Glad to see you back. Great cards!I love the new bracket die! Fabulous, Jody! 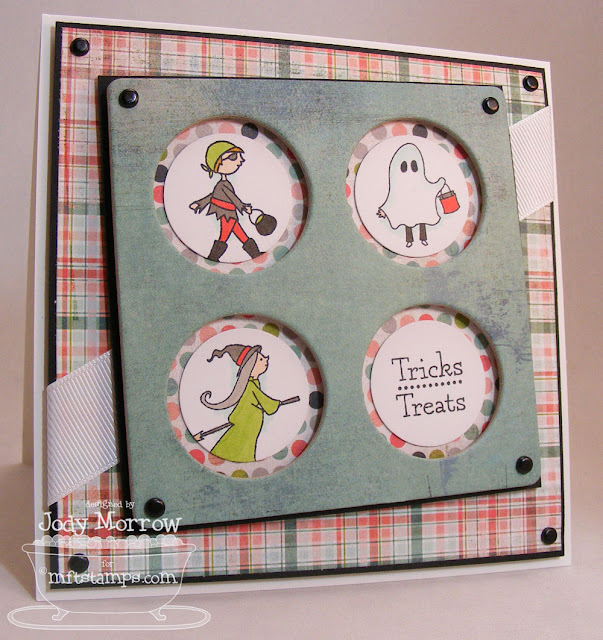 Love how you showed the different ways to use that awesome bracket die! Oh Jody, these cards are fantastic! And you forgetting how to stamp?! Impossible! It's like riding a bike! LOL! Fabulous cards....and that scalloped banner die...delish! nice job, I love your paper choices! Very cute cards great die also. very very nice. Anywho...... Great teasers!! Like the brackets on those great card!! Wowza, where do I begin? there are just so many awesome projects produced using one die. I am so in!! Love these idears! lol. Your cards are fabulous. 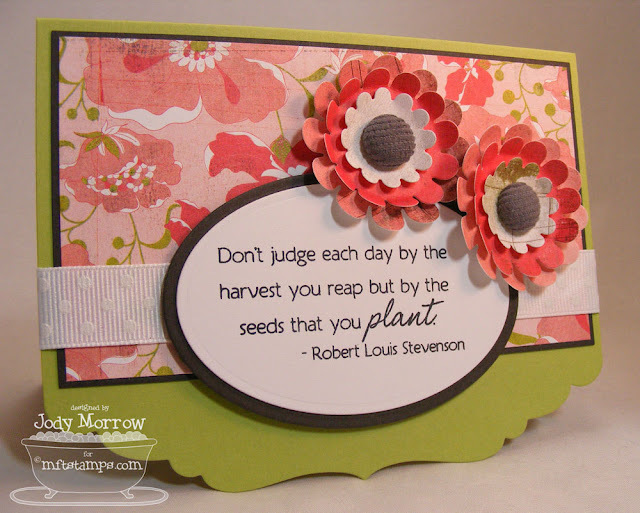 That bracket die is great and the flowers you can make with the other die. Can't wait to get my hands on them . I love your little about me bio! Great projects! ...the little monsters.... I hear ya girl! The bracket die is too cool. And I love color papers you chose. thanks for the chance. Wow, that new bracket die looks amazing! ACK! LOVE that new bracket die!! FAB layouts too! !